This topic may not meet the Wikitravel criteria for a separate article and should be merged into Southeast Asia. If you have an opinion, please discuss on this article's talk page. Please do not add new content to this article, but instead add it to Southeast Asia. You can help by copying any relevant information from this page to the new page. Once all content has been copied, this article should be made into a redirect. Please do not remove this merge notice without first gaining consensus for the removal on the article's talk page. One month in Southeast Asia gives an itinerary for the highlights of Southeast Asia. What is the meaning of the cities' names in this itinerary? This itinerary is a guide for travelers for some highlights of Southeast Asia. Kuala Lumpur; the capital of Malaysia, it is the seat of the Parliament of Malaysia as well as one of the Financial centres, its history starts when Chinese labourers were hired by a Malay chief; Raja Abdullah who ordered them to open more, new and larger mines. In the 1880s, railway was made available which led to the development of Kuala Lumpur. Indians, Malays and Chinese made their own enclaves within the city, one example is Chinatown and Jalan Tun Perak. Today Kuala Lumpur stands proud and tall with its Petronas Towers as the capital of Malaysia and one of the fastest growing cities of this age. Penang used to be one of the Straits Settlements along with Malacca and Singapore, on 2008 Penang along with Malacca is described as a UNESCO World Heritage Site because of its unique architecture and culture. Singapore is hailed as one of the cleanest countries in the world, thanks to its strict rules, it is known as Disneyland with the Death Penalty, Singapore is a diverse city-state and is one of the most developed countries in Asia. A diverse population composes Singapore and Malaysia; the Malays, Chinese and Indians. Cuisine too is affected by diversity, Malaysian cuisine and Singaporean cuisine consists of Chinese, Malay and Indian dishes. A minority of Europeans and Asian-Europeans reside in the two countries. Thailand's capital; Bangkok serves as one of Thailand's financial centers, it is the gateway to the whole of Thailand who boasts itself as the only country who wasn't colonized by any Western power as well as one of the most visited countries in Asia. Ayutthaya became the capital of early Thailand; Siam, it had been a major trading capital in Asia due to its location in between China and India. Sukhothai was one of the former capitals of early Thailand, today it stands in ruins and is a popular destination for tourists for its temples and Buddha statues. King Ramkhamhaeng the great has a connection with Sukhothai, he created the Thai alphabet, laid foundations for politics, religion and Monarchy which makes Sukhothai important in History. Angkor Wat in Cambodia is considered an architectural wonder which made it as a UNESCO World heritage site, the temple is first build as a Hindu temple but as Jayavarman VII converted to Buddhism, the temple was converted into a Buddhist temple. Note: Brunei, Myanmar and Laos aren't included but we do hope soon it will be. 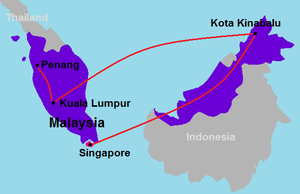 The airports of Bangkok, Kuala Lumpur, Singapore, Ho Chi Minh City, Jakarta and Manila are the main gateways to Southeast Asia, they all have connections from Europe, the Middle East, Indian Subcontinent, East Asia, the Americas and Australia and to some extent Africa. Kuala Lumpur Fly to Kuala Lumpur, Malaysia Airlines; Malaysia's flag carrier has a lot of options. From Kuala Lumpur you can either fly, drive, use the buses for getting out. Penang If you want it quick, fly but if you want to save then use a bus. Same way applies in getting out of Penang. Kota Kinabalu Via Kuala Lumpur from Penang, the best option is to fly in Kota Kinabalu. Same way applies in getting out. Singapore Take a plane to Singapore and take the same thing getting out of Singapore. 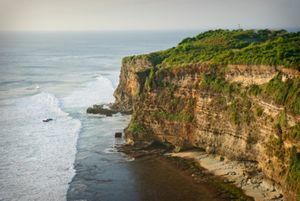 Driving won't be quite an option in exploring Indonesia and Philippines as two are archipelagos, the best options are getting a ship or a plane. Head to Malaysia's capital Kuala Lumpur and land at Kuala Lumpur International Airport. Spend the day/night for leisure or venture into Petaling Street (Chinatown) at night for food and shopping. Try the ethnic Malaysian cuisine, explore the old area of the city around the Central Market and see the iconic Sultan Abdul Samad Building at the Merdeka Square, then move over to the Kuala Lumpur City Centre (KLCC) to see the Petronas Towers. Climb the 272 stairs to reach Batu Caves and chill out in the evening at the Bukit Bintang area. After 3 days of exploring Kuala Lumpur, head to Penang which is 4-6 hours by bus and experience Penang's culture. Head to Kota Kinabalu and see Kota Kinabalu's wildlife especially the Orangutan and climb Mt. Kinabalu which is the highest mountain in Southeast Asia. Dive at one of the world's best diving sites in Sipadan and Mabul Island in Semporna. From Malaysia get to Singapore through Bus, train or plane. A day to three days is enough to explore the little City-state of Singapore. See the Merlion, Raffles Hotel, experience Peranakan Culture and the diversity of Singaporean Culture. Race through the streets of Little India, eat curry, buy silk etc., then go to Chinatown and Bugis and Kamplong Glam. Don't leave Singapore without tasting the Chili Crab! Then see Sentosa Island. Land in Bangkok's International Airport; Suvarnabhumi (pronounced Su-Wah-Ma-Pu) International Airport. Spend the first day/night for leisure. After having breakfast explore Bangkok and see the Grand Palace, eat Thai street food etc. Take a culinary course in Thai cuisine. Then head to the historical city Ayutthaya and see different temples. 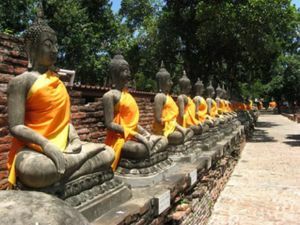 See the old Buddha statues in Sukhothai. Head to the beaches! Fly to the island of Ko Phi Phi, Ko Lanta or to Surat Thani which is the main land of Ko Samui, Ko Pha Ngan, Ko Tao islands Khao Sok National Park and Sivijaya empire for one week. See and experience Phuket in southern Thailand which is the original Thai paradise island or go north to Chiang Mai orChiang Rai in the heart of the Lanna culture. From Bangkok; Ho Chi Minh City in Vietnam. Explore Ho Chi Minh and then travel through Mekong Delta to Cambodia, see Phnom Penh and Siem Reap; see the Angkor Wat. Relax on the beaches and mangrove lined rivers of Sihanoukville. From Hanoi in the north or Da Nang in central Vietnam cross the border into Laos by bus (8-12 hours). Spend a week visiting ruins and the Mekong river area. Fly (1 hour) or take a bus (8-14 hours) from Siem Reap, Cambodia back to Bangkok. Land in Indonesia's capital; Jakarta. 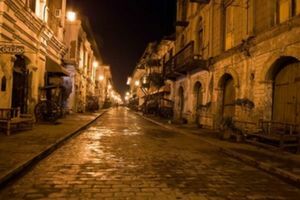 Spend the night for leisure, the following day explore the city. Spend a week in Bali, known as The Island of God. Do not forget Kuta Beach, Jimbaran, Nusa Dua, Uluwatu and Nusa Penida Archipelago. Go to Lombok Island by ship and spend your time in Nusa Lembongan and the volcanoes. 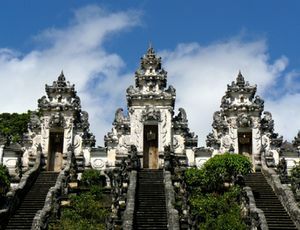 Then go to Yogyakarta, a traditional city with an exotic culture. See Borobudur, the biggest temple in the world. Spend your time in West Java, with the beautiful mountain, beach and an exotic city. Bandung is a must. It is called Paris Van Java and is famous for its 5 F's: Food, Fashion, Female, Flowers and Fame. And if you looking for nightlife, enjoy the experiences because Jakarta is the capital of nightlife in Southeast Asia. Dive in East Timor not lasting than 2-3 days. Land at the Philippines' capital; Manila. Explore Metro Manila. 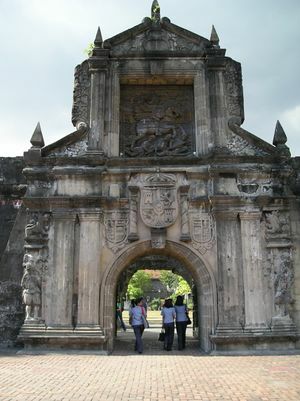 Then stroll the old, walled city of Manila called Intramuros and Fort Santiago and be thrown back to the time of the Spaniards. After your historical tour, see Mall of Asia; one of the world's largest malls and see its ice rink which is Southeast Asia's only Olympic sized ice rink. Then head north to Subic Bay, Zambales and dive at the wreckage of World War II ships and go on a Tiger Safari at the Zoobic Zoo, Subic too is a watersport destination, then head to Banaue and Batad to see the Rice Terraces, visit Vigan; which is a Spanish Colonial town. Fly to Caticlan going to Boracay, Named as one of the world's best beaches, it is famed for its sugary white sand and crystal clear waters unequaled by any other beaches in the region. Fly then to Guimaras to taste sweet mangoes then to Bacolod and taste sweet treats and the famed Chicken Inasal. Fly to Bohol via Cebu, Over a thousand similar looking hills dubbed as Chocolate Hills and see the Tarsier. Get back to Palawan and head to Puerto Princesa and see the Puerto Princesa Subterranean Park. Finally head to Davao and taste Durian; smells like hell but tastes like Heaven. This page was last edited on 7 February 2017, at 06:15.